As 2015 draws to a close, it's only natural to look back at what was accomplished in the past year and to think about all that still needs to be done. 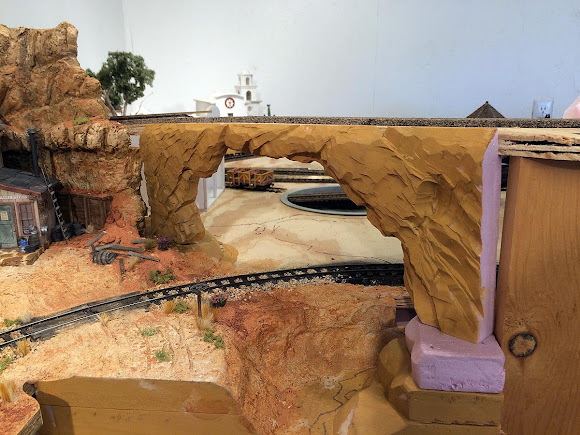 The TMMC has come a long way this year, with the entire mainline now complete through the expansion areas, a more logical layout for the town, and scenic work well underway in Rainbow Caverns and Hanging Rock. Still, there's much yet to be done. So many projects in fact that at times it can be a little overwhelming and I start to wonder if maybe I haven't bitten off more than I can chew. Thunder Mesa isn't really a very big model railroad, but the high level of detail, scratchbuilt structures, animation and lighting effects means that progress can be rather slow at times. Still, my enthusiasm for the project remains high, and there are a number of projects that I'm looking forward to tackling in the new year. So, without further ado, here's a look ahead at some of the TMMC's "unfinished business" that I'd like to get done in 2016. This lone, temporary trestle bent has been standing in for a real bridge over Geyser Gulch for longer than I care to admit. I've drawn up plans for the bridge, purchased materials, and even figured out a way to make "Old Unfaithful" geyser erupt in the background. I just need to make time to finally finish this signature scene. Just to the right of Big Thunder Creek stands this paper mock-up of Thunder Mesa Mill, based loosely on the boarding area structure for Big Thunder Mountain at Disneyland. This is where all of the ore from the mines at Calico and Big Thunder Camp gets processed before being shipped out to the wider world. As such, it's pretty important to the economic lifeblood of the railroad. 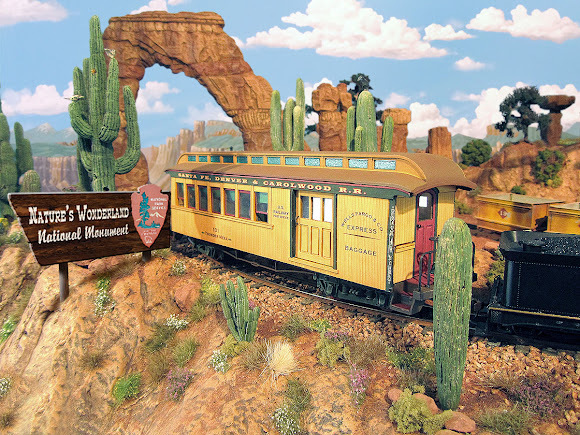 It's also a signature scene that really helps to establish the story of the railroad. 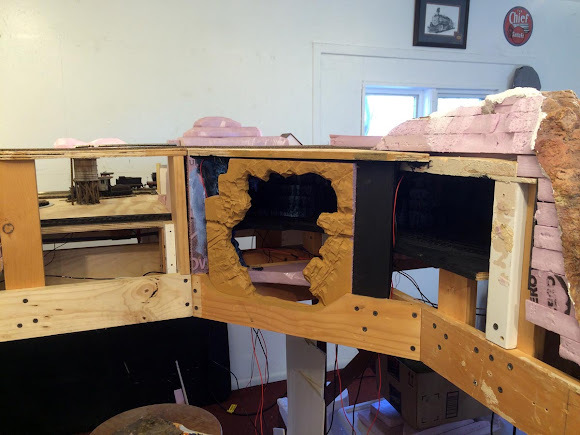 Replacing this mock-up with a fully detailed, scratchbuilt structure is high on my list of priorities for the new year. Don't be fooled by the pretty photos I post, most of the walls around the TMMC layout are still embarrassingly bare. I've been using temporary backdrops for most photos and Photoshop composites for the really arty ones. But help is on the way. The above image is a low-res version of a digital painting I created that will be printed upon 3oz vinyl scrim and then affixed to the layout room walls. This will give me a seamless sky backdrop that wraps around three sides of the layout. Landscape features like distant buttes and mesas will then be painted on 1/8" hardboard and mounted between the 3-D layout scenery and the sky backdrop. This should make for some dramatic scenes that look like they go on forever. Hoo-boy, there's loads to do here. 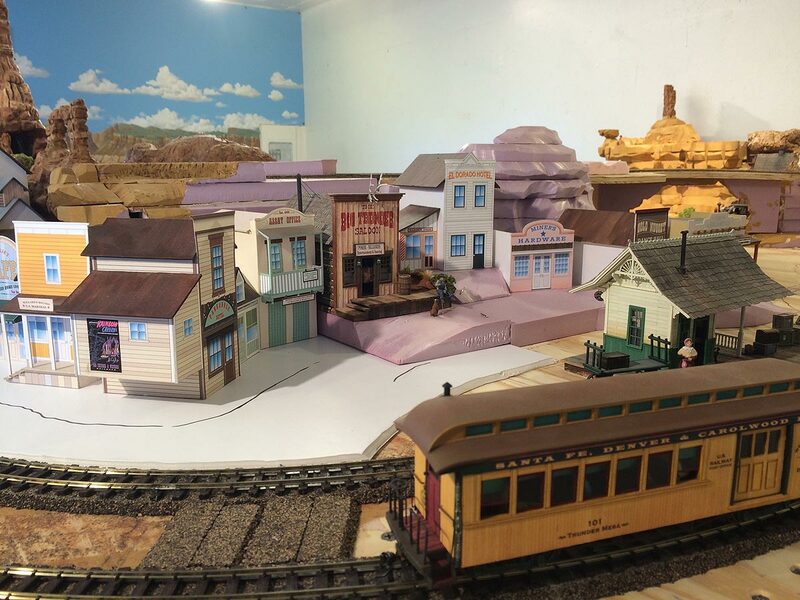 Other than the depot and Big Thunder Saloon, nearly everything in town is still in the paper model mock-up stage. As usual, I'll have to take it one structure at a time and finish what I can. It's highly doubtful that I'll get all those little building done in the coming year, but I would like to make a good start on the scenery and ground cover and then tackle as many of them as I can. We'll see what happens. Well, at least the water tank is finished (but that might be moving to Hanging Rock). 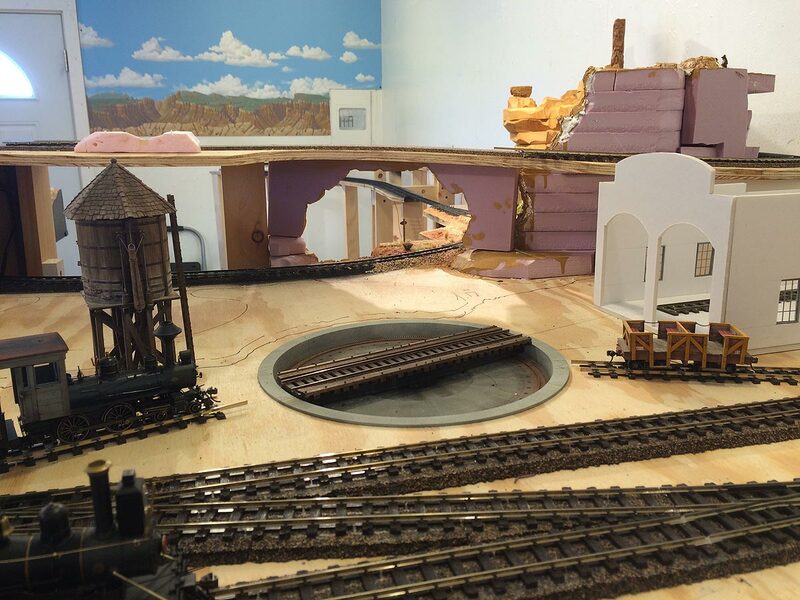 The current turntable here is unpowered and a hold-over from an earlier version of the railroad. I'd like to replace it this year with one of the fine A-frame TT's from Kitwood Hill Models. The engine house is planned as a white-plastered stone structure to harmonize with the adobe structures of nearby San Lorenzo. Time will tell if that plan pans out or I decide to go with something else. Obviously, the turntable approach track and engine house tracks are waiting for more permanent structures to be built. All of the track in this area needs paint, ballast and final detailing. These two go together because one sits right on top of the other. I've made some good progress on the interior of Rainbow Caverns this year, but as you can see the exterior scenery is still far from finished. I'd like to finish the rest of the interior scenes this coming year and complete the rockwork cave openings on the exterior. 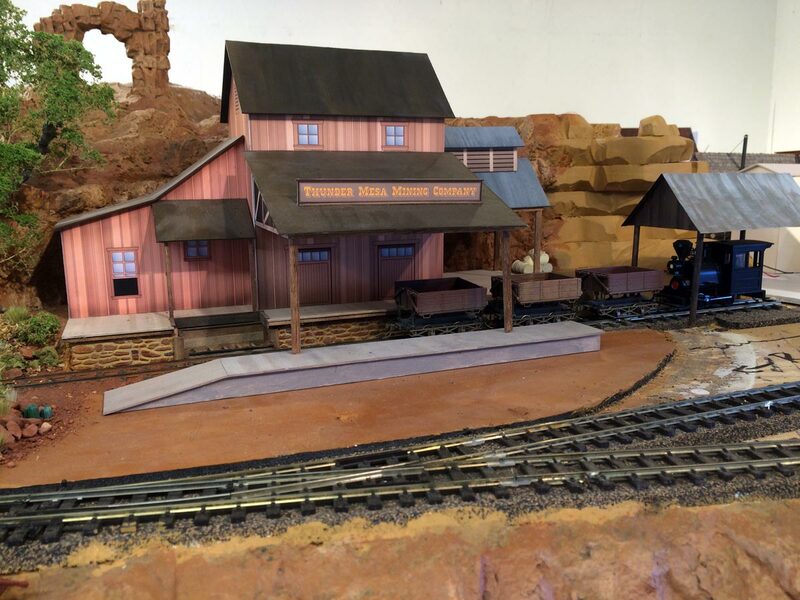 As for Big Thunder Camp, it's planned as a major mining scene with several scratchbuilt structures. Sounds like a good candidate for my 2017 list. In 2016, I'll be happy to get the final track laid up there and all the wiring done for the lighting and animation to come. This is the connecting bit of scenery between Hanging Rock on the left and Rainbow Caverns on the right. It shouldn't take very long to finish up this scene once the branchline track to Big Thunder Camp is laid across the top of the bridge. This scene is still a little less than half finished, mostly because the plans are not yet 100% firm in my mind. Olson & Furlow's place still needs LED lighting installed and a few more outlaw figures. 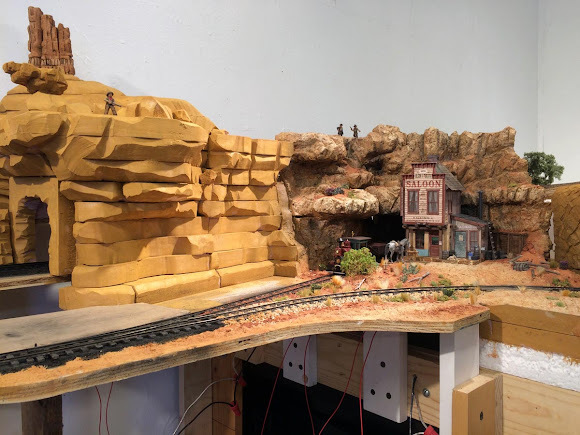 A small depot made from an old combine car is planned for the near side of the tracks, while an ore tipple, shack and water tank will probably be against the cliffs on the other side. There's much more rockwork to be finished and a couple of tunnel portals to detail too. The tunnel interiors will be a project all their own. 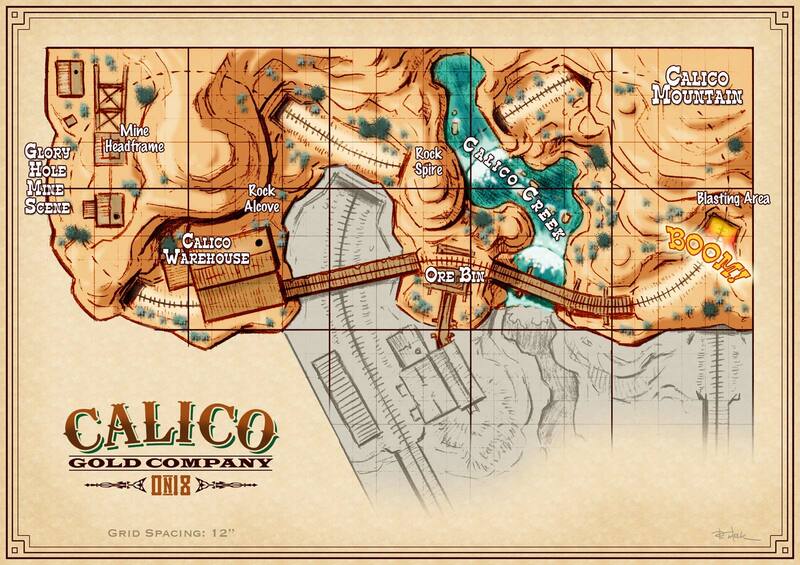 Last but not least is the portable On18 Calico mini-layout that so far exists only in the planning stages. 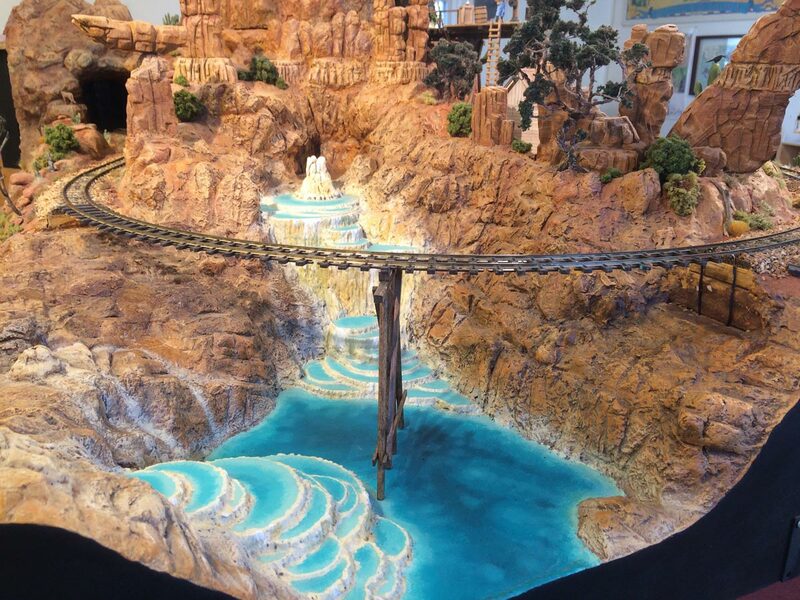 This almost qualifies as a substantial model railroad project all on its own and I could probably spend most of 2016 working on it and nothing else. The latest plan, shown above, is slightly simplified from the earlier figure eight scheme proposed. It hews a little closer to the Knott's Berry Farm inspiration now while promising to be easier to operate. My tests with N scale/On18 mechanisms told me that they didn't much like the 6% grade I had in mind before. This flat, simple loop now gives me room for an underground "Glory Hole" mining scene and some animated blasting on the other end. I have no illusions about finishing Calico in the coming year, but I would very much like to make a good start on it and at least get some On18 equipment running. Once again, time will tell. Once again I would like to give my sincere thanks to everyone who has been following along with my modeling efforts on the TMMC. You guys are the best and I'm just getting started. I wish each of you all the blessings of the season, a very merry Christmas and a happy, healthy and prosperous New Year. Feliz Navidad, amigos! Adios for now.